In one of my previous posts, I wrote about how to install Mac OS X Yosemite 10.10 in VMware as a virtual machine(with video tutorial). Mac users stuck in a problem when they want to change the partition name because they are doing that with Disk Utility, which allow you to change the partition name with erasing it. But that's too sad, because you don't want to lose your data or back up it which will take a long time, and all that big process for a little thing, to change the partition name. Today I will show you how to change any partition name without erasing it in Mac OS X operating system. The first thing you need to do is open up a terminal. After you need to easily execute next command. /usr/sbin/diskutil rename "Mac OS X Yosemite" "Cyber Programmers"
So do not forget to change Mac OS X Yosemite with your partition name and Cyber Programmers with the new name you want to apply to partition. Right click on that partition and select "Get info" line. 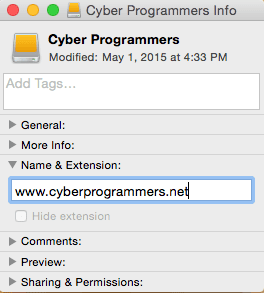 Now in opened window open "Name & Extensions" list and there type a new name of the partition. 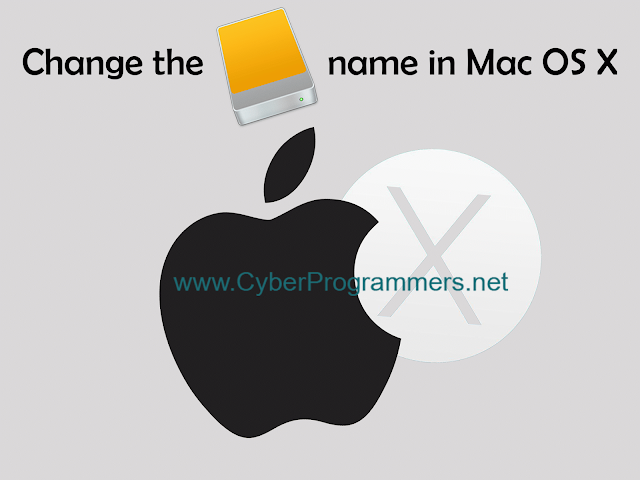 So now you can change any partition name in your Mac OS X operating system without any problem.